Tia: Maybe it's because we've gotten everything we've ever wanted. More even. Tony: It just doesn't leave us anything to wish for. Is that it? Tia: I think so. Tony, we've got to get out of here before it's too late. Please! Long before Disney produced The Sixth Sense, the studio bestowed psychic powers on a couple of other cute, wide-eyed children�with more light-hearted results. In Escape to Witch Mountain, Tia (Kim Richards) and Tony (Ike Eisenmann) don't see dead people, nor are they tortured by their ESP. Instead, they get to have fun with their awesome mental gifts�telepathy, levitation, telekinesis, and other talents that would turn any normal kid (and even Stephen King's Carrie) green with envy. They also predict the future with ease, but have trouble reconstructing their past, which puts them at the mercy of some dastardly and manipulative adults. Orphaned since early childhood, Tia and Tony are often ostracized by their peers, who find their supernatural abilities freakish. So when megalomaniac millionaire Aristotle Bolt (Ray Milland) offers to take them under his wing, they're seduced by his doting nature, lavish lifestyle, and seemingly sincere empathy. But soon Tia senses trouble. Haunted by fractured memories of a childhood trauma, she believes she and Tony must flee Bolt's compound and search for whatever family they might have left. A secret map and chance encounter with a kindly, paternal camper (Eddie Albert) aid them in their quest to unlock the mystery of their existence. Meanwhile, Bolt and his portly henchman Lucas (Donald Pleasence) seek to recapture the kids so they can exploit their clairvoyance for Bolt's personal gain. Kids have always loved Escape to Witch Mountain for its magical mixture of fantasy, adventure, adolescent camaraderie, and warmth. Directed with standard Disney verve and a contagious sense of wonder by John Hough, the film will surely enchant new generations thanks to this comprehensive special edition DVD. Although at its core the story is basically a variation on the journey-back-home theme made famous by The Wizard of Oz, the film's spunky leads and sci-fi twist give Witch Mountain a fresh slant that helps soften the clich�s. Beautiful location shooting along the northern California coastline also injects the tale with a welcome dose of realism often absent in Disney fantasies. Still, it's the special effects that truly captivate younger viewers. Although ballyhooed at the time of the film's release, Witch Mountain's wizardry might seem cheesy by today's high-tech standards, but taken in the context of its time, it's easy to appreciate the creativity and invention of Disney's imagineers. Kids like nothing better than watching inanimate flying objects terrorizing bullies and bad guys, or road vehicles taking to the sky to help the heroes forge their getaway�and Escape to Witch Mountain obliges in spades. The fact that all the gimmicks are well integrated into the story and amusingly presented only enhances their effectiveness. So does the professional acting. Richards, who melted hearts on a weekly basis in the TV classic Nanny and the Professor, employs a style reminiscent of Margaret O'Brien, often protruding her lower lip to excess. Yet it's tough to resist her charm, and she and Eisenmann create a natural rapport that bolsters the film immeasurably. Ditto the old-pro presence of such stalwart performers as Albert, Pleasence, and the legendary Milland. All three look like they're having a ball (Milland especially seems to relish his villainous role) and they lend Witch Mountain a legitimacy other Disney fare of the period lacks. Has the film aged well? Yes and no. For better or worse, tastes have certainly progressed since Escape to Witch Mountain first premiered, but the film possesses timeless values and an implacable heart that overshadow any dated elements. Today's youngsters might not respond to the movie as intensely as those of a previous generation, but they'll certainly enjoy the story and effects. And so will their parents. Image Transfer Review: Disney delivers once again with the type of high quality anamorphic transfer that makes the studio a leader in digital entertainment. While the source material exhibits typical wear and tear for a 28-year-old film, the sporadic nicks and spots rarely detract from the image's overall vibrancy. The numerous scenic exteriors come across extremely well, featuring excellent contrast and lovely color saturation with no bleeding or shimmering. Edge enhancement seems completely absent as well, allowing viewers to enjoy the crisp details and smooth lines without distraction, and while a faint amount of grain is noticeable, it adds a nice softness to the film. Fleshtones are a bit too red, but that's a minor quibble and hardly dampens this first class visual treatment that will surely delight Witch Mountain's many fans. Audio Transfer Review: While the sound is crisp and clear throughout, the DD 5.1 track disappoints by rarely�if ever�employing the rear speakers. The front heavy mix possesses no ambient elements and little opportunity for any .1 LFE action. Johnny Mandel's recognizable (if repetitive) score plays well and dialogue is always comprehendible (if a bit tinny). The lack of any sonic envelopment, however, lessens the film's impact, especially during the fantasy and sci-fi sequences. Extras Review: Disney has packed a solid collection of extras onto the Witch Mountain DVD, at last lavishing a live-action film with the type of full-blown special edition normally reserved for its animated features. Of course, Disney couldn't abandon animation altogether on this disc, and includes the short 1940 cartoon, Pluto's Dream House, as a prelude to the main feature. Filled with pratfalls and humor galore, the animated romp looks beautiful on DVD, with lush, vibrant colors and surprisingly few print defects. Also in "The Film" section of the disc, a worthwhile scene-specific audio commentary by stars Kim Richards, Ike Eisenmann and director John Hough contains some interesting trivia nuggets and amusing behind-the-scenes anecdotes. Richards and Eisenmann sound like they haven't aged much over the years, reminiscing with a juvenile enthusiasm accented by jokes, giggles, barbs and constant interruptions. Their light-hearted attitude, however, can't disguise their deep affection for and appreciation of Witch Mountain. Hough (whose comments were recorded separately and edited in) offers more substantive information, discussing his intention to convey as much realism as possible by shooting three-quarters of the film on location�an unusually high percentage for a Disney movie back then. While he loved Disney's artistic environment and meticulous attention to detail, Hough states he didn't direct Witch Mountain to please the core Disney audience; instead, he catered it to his own taste and that of his children. He describes Ike as "quiet" and Kim as "bouncy," and claims he never talked down to them, always treating the kids like professional adult actors. "The Vault" houses the lion's share of the disc's special material. An elaborate animated menu leads the viewer to a 26-minute documentary, Making the Escape, which concentrates on the film's production process, with plenty of attention paid to the creation of the film's special effects. In addition, we learn that Jodie Foster tested for the lead and Kim Richards' favorite scenes were ones in which she wore pajamas and fuzzy slippers. Milland, Albert, and Pleasence all are fondly remembered in this standard but entertaining puff piece. Disney Effects: Something Special is a self-congratulatory look at 40 years of Disney films that feature visual wizardry. The 11-minute retrospective makes the point that Disney's lofty reputation was due to its cutting edge visual effects, and the studio pioneered many techniques, beginning in the 1950s with 20,000 Leagues Under the Sea. Production personnel discuss the contribution of optical printers, matte paintings, and digital technology in relation to various films, with plenty of clips providing examples of the studio's handiwork. The nostalgic Disney Studio Album provides a look back (although for audiences of the day, it was essentially a preview) at what the studio was cooking up in 1975, the year of Witch Mountain's release. Future films, new theme park attractions, reissues and TV shows are all showcased in this three-and-a-half minute featurette. Much less interesting, Disney Sci-Fi is nothing more than a self-congratulatory music video featuring snippets from a variety of the company's futuristic titles. In Conversations with John Hough, we get a more personal look at the British director, who talks of his television roots, affection for Disney, child-like view of the supernatural and how a director must be "a little bit of a psychologist to get out the best in people." Last, but certainly not least, the Escape to Witch Mountain Galleries contain approximately 90 production and backstage stills, lobby cards, posters, excerpts from a Witch Mountain comic book and photos of various merchandise tie-ins. 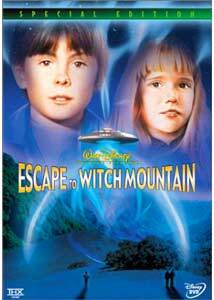 Escape to Witch Mountain remains an engaging family classic and one of Disney's better efforts in the live-action genre. With a sparkling image transfer and plenty of rainy day extras, this special edition DVD deserves a place on every family's DVD shelf right next to its more famous animated cousins.